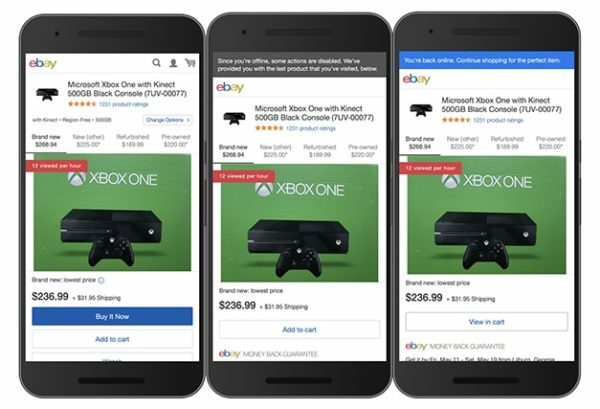 According to a recent announcement from eBay, the company plans to incorporate Progressive Web Apps (PWA) technology to make its web experience much better for users with low-quality internet connections, starting with Android. A PWA is effectively a cached version of a website that acts like any other application. That allows for some functionality of the site to be accessed even when a user is offline. PWA sites redownload, update, and recache as a connection becomes available, keeping everything up to date. For a service the size of eBay, that’s obviously going to take some time to get rolled out. However, thanks to the way the company is going about it, that’s not going to take nearly as long as it might if it was to rebuild the site for every product page. In fact, the company plans to have PWAs rolled out to Android users as early as the second half of this year and already has a test page ready to go. With regard to how eBay is accomplishing the switch, the company is not rebuilding its site from the ground up. Instead, it’s going to incorporate a service worker to handle PWA technologies in between a user’s browser and the website. That will enable the company to enhance its current “caching, prefetch and navigational behaviors” by running in the background, separately from the web pages themselves. In fact, the use of those means that eBay will work offline to provide cached versions of its product pages whenever a connection is unavailable. That should have the added benefit of keeping what’s stored on end-user devices to a minimum. In the meantime, the company is rolling those out to product pages first, with plans to expand to other pages in the future. The goal is to have an eBay that allows users to quickly check out products they were trying to buy via a cached version of the eBay website even when their connection goes down. That’s bound to be useful for those who live in areas where connectivity isn’t great. From there, users can then plan their purchases and even click the “add to cart” button, just as they normally would, to have the item automatically move to the cart once connectivity is regained. Anybody who wants to check out what that might look like simply needs to follow the banner below on an Android device and then disable their connectivity options. Once that’s done, they just need to refresh the page.